Emerson Bed w/Rails. Includes Headboard, Footboard and Side Rails. Headboard: 46H and Footboard: 36H. Strong Construction. Available in Full, Queen or King Size. 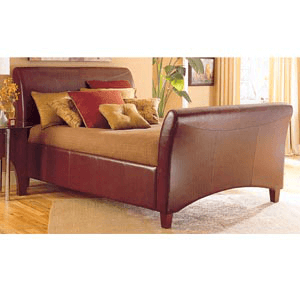 Charles Bed in Cognac Finish. Includes Headboard, Footboard, Rails, Slat, and Center Support. Available in Full, Queen and King Size. Strong Construction. The Zoe Leatherette Bed Features A Hydraulic Lift Which Reveals Storage Space Underneath The Bed Frame. Also Features Wooden Slats For Mattress Support. Available In Full Size, Queen or King Size In Black, Brown Or Beige. Strong Construction. Easy To Assemble.